Napa County attracts more than five million visitors annually. Coupled with population growth in Solano and Sonoma counties, SR 29 and 221 have become major interregional highways serving residents, visitors, workers and freight. Annually commuters endure up to 225* hours of delay in the morning and 630* hours of delay in the evening at Soscol Junction due to congestion. The Soscol Junction project is a crucial step in relieving future traffic congestion. Congestion at Soscol Junction has worsened over time, fueled in part by tourism, population growth and economic development. Housing production is not keeping pace with the creation of new jobs in Napa. Consequently, Napa’s workers commute in from adjacent counties contributing to the traffic issues. 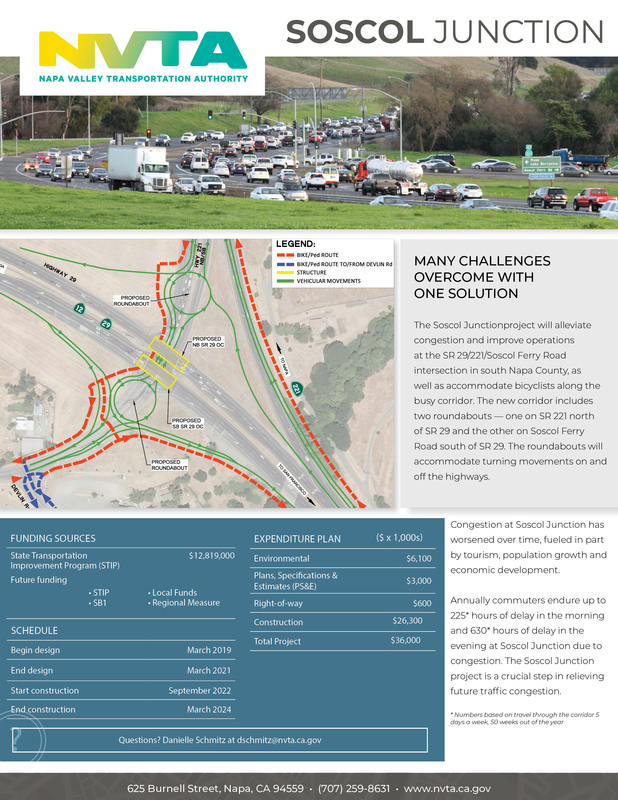 The existing highway configuration cannot accommodate the current traffic volumes – volumes that are likely to grow in the future.